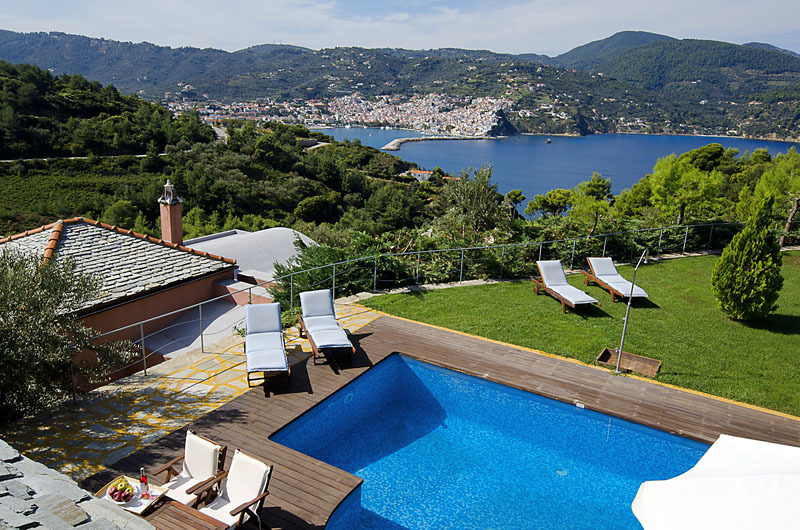 Set in its own gardens on Mount Palouki and offering superb views overlooking Skopelos, this elegant villa is ideally located for easy access to Skopelos Town, the beaches and historic interior of the island. This modern and spacious villa, situated in lawned gardens on the side of the mountain, not only enjoys a superb outlook over the harbour but also is just a few minutes’ drive from the Skopelos Town and is convenient for the beaches and unique pine forests of this fascinating island. 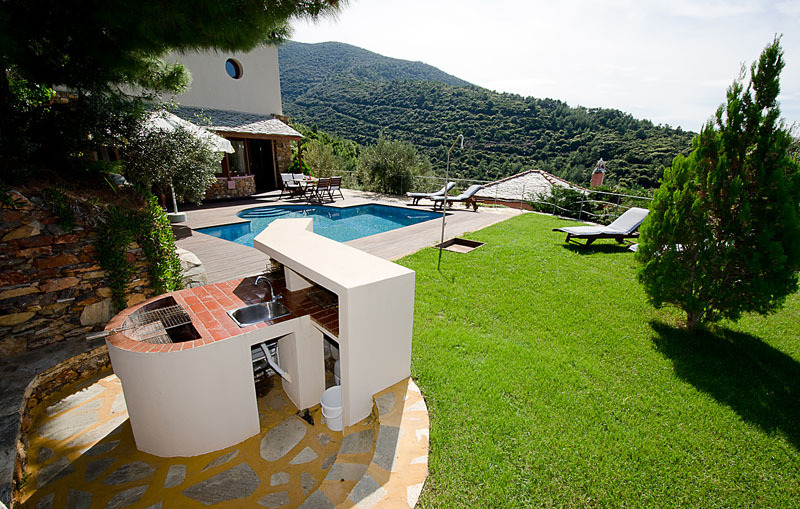 The pool terrace beside the house with surrounding decking leads out onto a spacious lawned area with shrubs bordered by olive trees set against the natural slope of the mountain. There is a well-equipped barbecue and al fresco dining area complete with its own fridge, just the place to chill the famous Skopelos wines, considered by the Gods to be as fine as any in Greece! Comfortable seating is arranged so that the stunning views can be appreciated in comfort. The open-plan sitting room, dining and kitchen area opening on to a covered verandah also has large picture windows looking out to the pool and garden with a family bathroom with shower. Two bedrooms, a double and a twin each have balconies, and with their high timbered ceilings are cool and airy. There is also a second bathroom with bath on this floor. 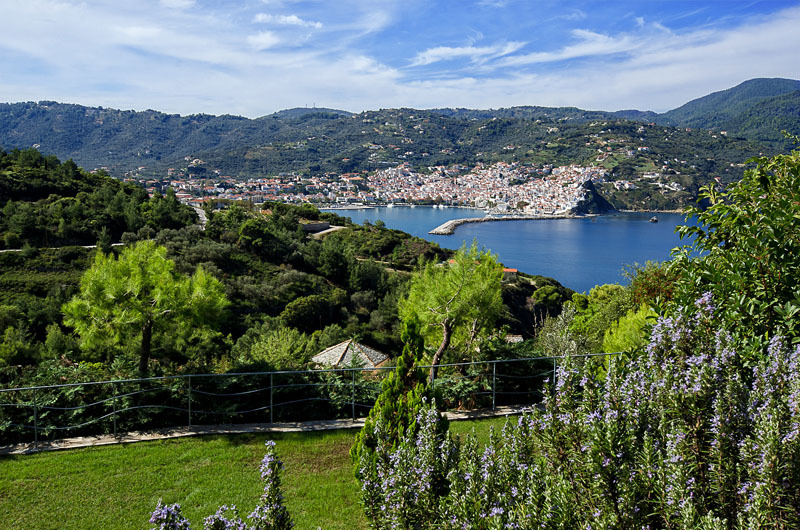 Mt Palouki is not only one of the most sacred in the Sporades Islands which is the site of three ancient monasteries, it also protects the natural harbour of Skopelos Town. 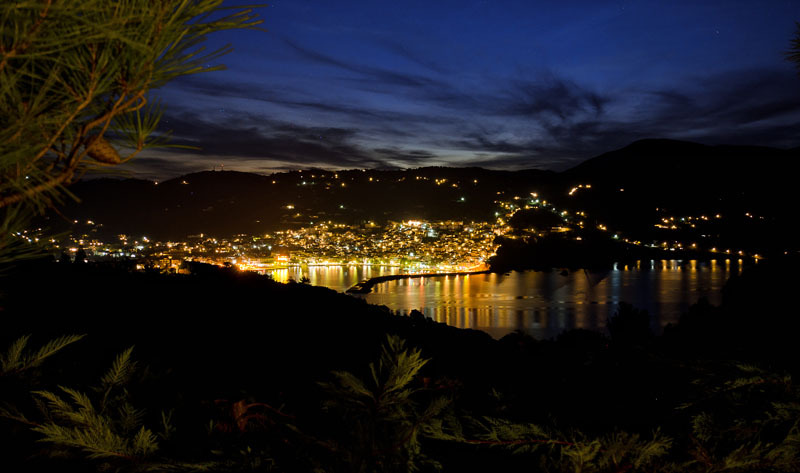 Palouki, meaning pencil in Greek, perhaps due to its profile, narrowing to a sharp point and a string of outer islands, is criss-crossed by ancient trails connecting the three monasteries higher up the slope and a stroll along any of these in the cool of the evening just as the lights come on far below and the sun has dipped behind the hills of the interior is a memorable experience. 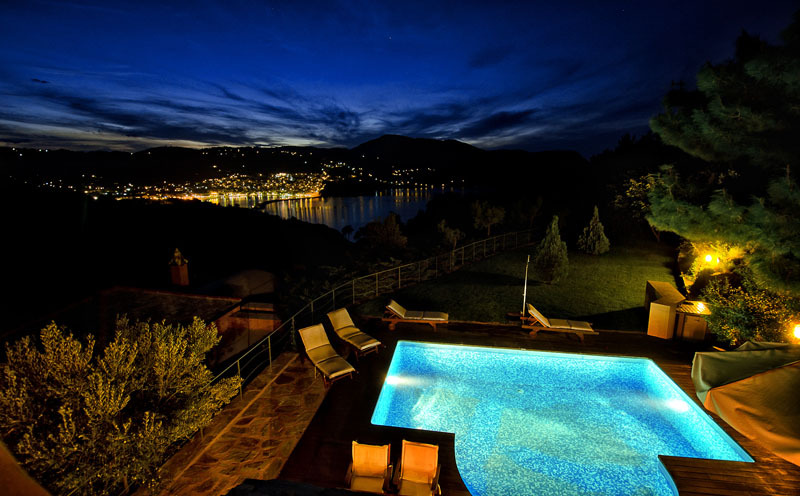 Villa Aetoma, is undoubtedly one of the best situated properties on Skopelos.